It will still exclude transgender men, or applicants born female but identifying as male. 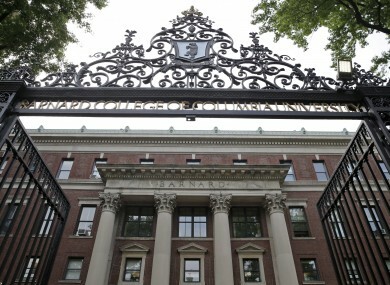 BARNARD COLLEGE IN New York has decided to admit transgender women, becoming the latest women’s college to issue a new policy acknowledging the complexity of gender. The policys says Barnard will consider applicants “who consistently live and identify as women”. That excludes transgender men, or applicants born female but identifying as male. The decision is an attempt to balance Barnard’s identity as a women’s college with what the school calls “recognition of our changing world and an evolving understanding of gender identity”. Though it won’t consider transgender men for admission, the school announced that the decision wouldn’t impact students who transition while already enrolled. The decision makes Barnard the latest prominent women’s college — and last of the traditional Seven Sisters schools — to update its admissions policy. In the last nine months or so, each institution has come up with a slightly different formula. Barnard’s president, Debora Spar, led a monthslong exploration of the issue with her community, including five town halls (and one virtual town hall) for students, faculty or alumni, and an online survey that drew more than 900 responses. “As expected, a wide range of passionate and deeply held beliefs were discussed and debated,” Spar and board of trustees chairman Jolyne Caruso-FitzGerald wrote in a joint letter Thursday, following the board vote a day earlier. But on two main points, the responses were compelling and clear. There was no question that Barnard must reaffirm its mission as a college for women. And there was little debate that trans women should be eligible for admission to Barnard. Email “A women-only college in the US will now accept transgender women”. Feedback on “A women-only college in the US will now accept transgender women”.